SALT LAKE CITY (AP) — As a candidate, Donald Trump called for congressional term limits. As president, he is encouraging 83-year-old Utah Sen. Orrin Hatch to extend his streak as the longest-serving Republican in Senate history. Trump praised Hatch on Monday as “a true fighter” during a joint appearance in Utah, where the president signed proclamations scaling back two sprawling national monuments. “We hope you will continue to serve your state and your country in the Senate for a very long time to come,” the Republican president told Hatch, who is contemplating retirement as the end of his seventh term approaches. Trump’s support may have less to do with Hatch, however, than with a secret desire to block Mitt Romney from serving in the Senate. The president declined to publicly attack the 2012 GOP presidential nominee on Monday, saying only that “Mitt’s a good man.” But privately, Trump has signaled support for an effort to submarine Romney, who is considering running for Hatch’s seat — but only if Hatch retires. 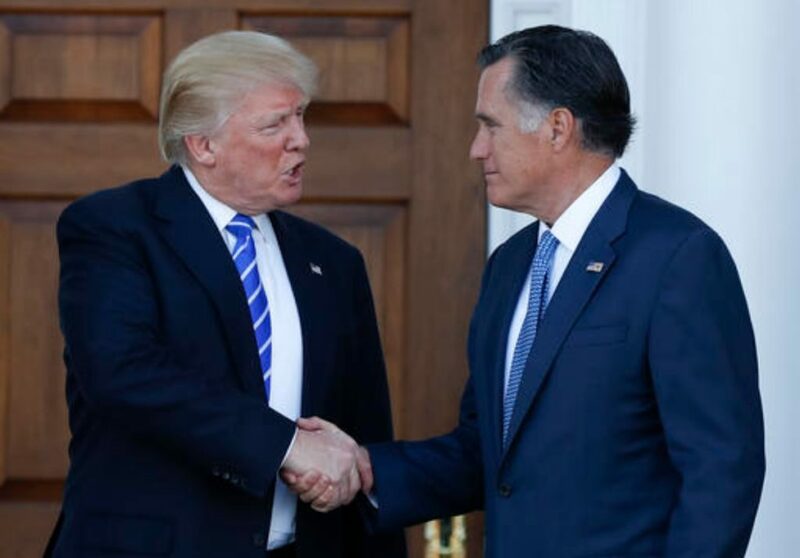 Trump has vowed to try to block Romney, whom he views as a potential thorn in his side in the Senate, according to a White House official and an outside adviser who have discussed the possible bid with the president. Trump’s push to stop Romney’s prospective Senate bid puts him in line with former White House strategist, Steve Bannon, according to a person familiar with discussions between the president and the Breitbart News head who, like others interviewed, was not authorized to talk publicly about private conversations and spoke to The Associated Press on condition of anonymity. Bannon has publicly vowed to wage war on Republican senators deemed insufficiently pro-Trump in next year’s midterm elections. Privately, he said he would prioritize stopping Romney, even if it meant backing Hatch, who entered the Senate in 1977. Romney fiercely criticized Trump during last year’s campaign and came to personify the “Never Trump” movement for a time. Speaking in Utah last year, Romney aggressively warned against a Trump presidency. “Donald Trump is a phony, a fraud. His promises are as worthless as a degree from Trump University,” Romney said. He charged that Trump’s domestic policies would lead to recession and his foreign policies would make the world more dangerous. “He has neither the temperament nor the judgment to be president and his personal qualities would mean that America would cease to be a shining city on a hill,” Romney said. Romney softened his opposition before the election, however, and was briefly considered to serve as Trump’s secretary of state. 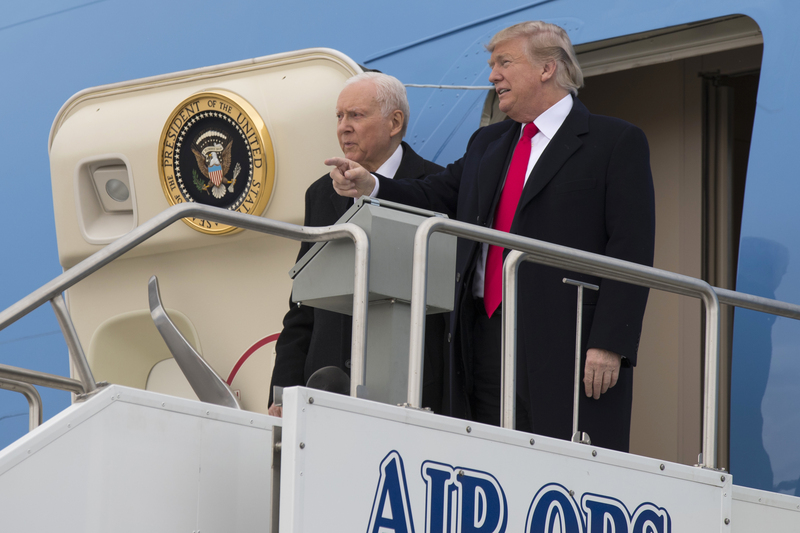 Hatch, who traveled to Utah on Monday aboard Air Force One, said as he disembarked at the end of the day that Trump had been urging him to run. But he said he didn’t make any promises to the president. “We’ll have to see,” he told the AP. “I’ve got a lot pressure to run and a lot of pressure not to … from my wife,” he said with a laugh. Romney has not publicly addressed his interest in the Utah Senate seat and is not expected to do so before Hatch makes his decision. His allies are frustrated by what they see as mixed messages about Hatch’s intentions. They insist that Romney, who relocated to Utah after losing the 2012 presidential election, would consider running only if Hatch retires, according to two people close to Romney who were unauthorized to speak publicly and spoke to The Associated Press on condition of anonymity. Romney’s team believed earlier in the year that Hatch would not seek another term. But suddenly backed by Trump, Hatch seems to be leaning in another direction. Trump called Hatch “a very special man” Monday. Peoples reported from Birmingham, Alabama. Associated Press writer Jonathan Lemire contributed to this report from New York. It’s time to retire Hatch. Romney is a different self serving animal that shouldn’t be in politics. I would lose zero sleep if both of these hacks expired. So…..let’s hope the voters in the great state of Utah can vote in their self-interest, which Hatch has not cared about for years. He has prostituted his position for financial gains (campaign cash), ignoring his constituents. There may have been a time when he worked to further the interests of Utah voters, but those days are long gone……. Mitt would be a change of face, and possibly someone who could help restore what the Republican Party used to stand for…….Of course, as the candidate known for modifying his position, depending on the political winds, he might just be a younger version of Hatch. Hatch is senile, easier to be manipulated by Trumps lies. Retire Hatch. I dont want to see him being wheeled out on the floor in a wheelchair of the senate to place his phony bought-off vote. Term limits, Please! I am so done with any and all politicians that feel the need to “serve” for more than two terms!